Initially he identified as a Shafi'ite in Fiqh law and Shafi'ites were happy to have him so considered. He was later seen[by whom?] as having established his own school. Although he had come to Baghdad in youth to study from Hanbal, he incurred the vehement wrath of the Hanbalites. Tabari's madhhab is usually designated by the name Jariri after his patronymic. However, in the keenly competitive atmosphere of the times, his school failed to endure. Al-Tabari's jurisprudence belongs to a type which Christopher Melchert has called "semi-rationalistic", largely associated with the Shafi'i madhhab. It was characterized by strong scripturalist tendencies. He appears, like Dawud al-Zahiri, to restrict consensus historically, defining it as the transmission by many authorities of reports on which the Sahaba agreed unanimously. Like Dawud al-Zahiri, he also held that consensus must be tied to a text and cannot be based on legal analogy. 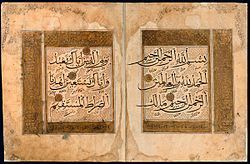 His second great work was the commentary on the Qur'an, (Arabic Tafsir al-Tabari), which was marked by the same fullness of detail as the Annals. Abul-Qaasim Ibn 'Aqil Al-Warraq (رحمه الله) says: " Imām Ibn Jarir (رحمه الله) once said to his students: “Are you all ready to write down my lesson on the Tafsir (commentary) of the entire Holy Quran?" They enquired as to how lengthy it would be. "30 000 pages"! he replied. They said: "This would take a long time and cannot be completed in one lifetime. He therefore made it concise and kept it to 3000 pages (note, this was in reference to the old days when they used ink and hard-paper which was a bit long format today). It took him seven years to finish it from the year 283 until 290. It is said[by whom?] that it is the most voluminous Athari Tafsir (i.e., based on hadith not intellect) existent today so well received by the Ummah that it survived to this day intact due to its popularity and widely printed copies available worldwide. Scholars such as Baghawi and Suyuti used it largely. It was used in compiling the Tafsir ibn Kathir which is often referred to as Mukhtasar Tafsir at-Tabari. ^ Jonathan A.C. Brown (2007), The Canonization of al-Bukhārī and Muslim: The Formation and Function of the Sunnī Ḥadīth Canon, p. 151. Brill Publishers. ISBN 9789004158399. ^ A.C. Brown, Jonathan (2014). Misquoting Muhammad: The Challenge and Choices of Interpreting the Prophet's Legacy. Oneworld Publications. p. 193. ISBN 978-1780744209. 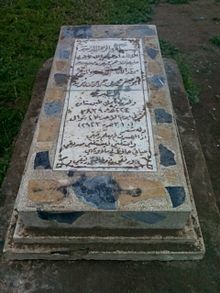 Although it eventually became extinct, Tabari's madhhab flourished among Sunni ulama for two centuries after his death. ^ Devin J. Stewart, "Muhammad b. Jarir al-Tabari's al-Bayan 'an Usul al-Ahkam and the Genre of Usul al-Fiqh in Ninth Century Baghdad," pg. 325. Taken from Abbasid Studies: Occasional Papers of the School of Abbasid Studies, Cambridge, 6–10 January 2002. Edited by James Montgomery. Leuven: Peeters Publishers and the Department of Oriental Studies, 2004. ^ Ibn al-Nadim, al-Fihrist, pg. 291. Ed. Rida Tajaddud. Tehran: Dar al-Masirah, 1988. ^ Christopher Melchert, The Formation of the Sunni Schools of Law: 9th–10th Centuries C.E., pg. 185. Leiden: Brill Publishers, 1997. ^ Yaqut al-Hamawi, Irshad, vol. 18, pg. 78. ^ Stewart, Tabari, p. 326. ^ al-Hamawi, vol. 18, pg. 57–58. ^ History of the Prophets and Kings, trans. Franz Rosenthal. Vol. 1: General Introduction and From the Creation to the Flood, pg. 52. Albany: SUNY Press, 1989. ^ Saliba, George. The History of Al-Ṭabarī = Taʻrīkh al-rusul wa ʻl-mulūk. Vol. XXXVIII. New York: State University of New York, 1985. Print. ^ a b c History, trns. Franz Rosenthal, pg. 78. ^ Joel L. Kraemer, pg. 62. ^ The History of al-Tabari (Tarikh al-Rusul Walmuluk). Vol. XXVIII: Abbasid Authority Affirmed, the Early Years of al-Mansur A.D. 753-763/A.H. 136–145 by Al-Tabari (Abu Jafar Muhammad Ibn Jarir); Jane Dammen McAuliffe, Review by: Daniel, Elton L. (1997). "Review". International Journal of Middle East Studies. 29 (2): 287–289. doi:10.1017/S0020743800064564. JSTOR 164026. ^ Osman, Ghada. "ORAL VS. WRITTEN TRANSMISSION: THE CASE OF ṬABARĪ AND IBN SAʿD." Academic Search Premier. EBSCO. Web. 15 May 2012. ^ A Local Historian's Debt to al-Ṭabarī: The Case of al-Azdī's Ta'rīkh al-Mawṣil, Chase F. Robinson, Journal of the American Oriental Society, Vol. 126, No. 4 (October – December 2006), pp. 521–535, Published by: American Oriental Society, Article Stable URL: https://www.jstor.org/stable/20064541.